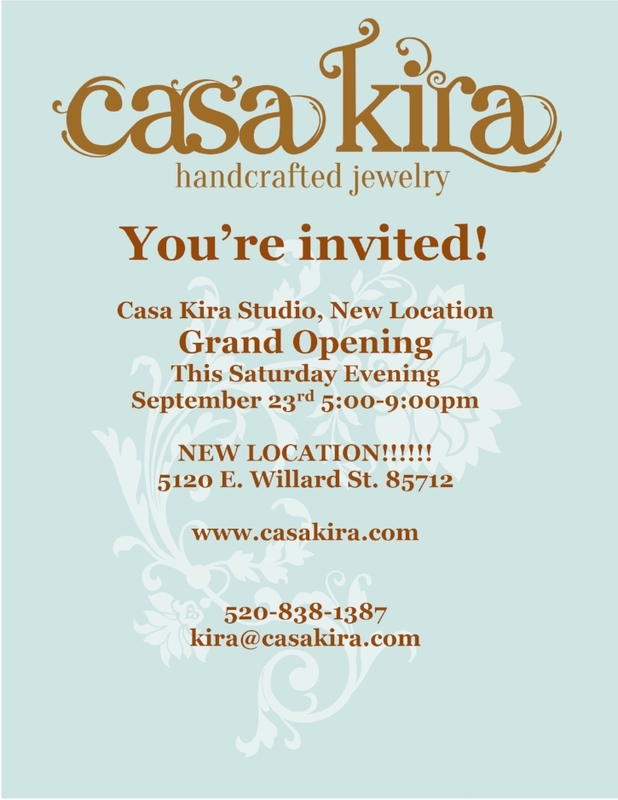 Casa Kira Studio is moving to a new location in central Tucson. Stay tuned for updates. In the meantime: Save the date! Casa Kira moving sale Saturday August 26th. Make sure you are on the email list to receive Open House invites straight to your email box. Click Join email list at the top of this page. Moms, Mimosas, Massage and Jewelry..Oh My! Stop by the studio Saturday 13th. Enjoy a unique shopping experience! Sip mimosas, indulge in a shoulder massage by Caryn Isom Fraser, and treat yourself or someone you love to a piece of Jewelry from the latest Casa Kira line. CHECK OUT THE EVENTS PAGE FOR ALL THE DETAILS! Bring your Valentine to the Open house for a glass of champagne and shop together, or let Kira assist you in choosing the perfect gift for your special someone. Meet the neighbors.Chester Moon and El Arabe. Oh, and that cute mountain biker in the background is my kid, comming over after school. Loving the views from The Casa Kira Studio! Local Buyers collaborating with Local Makers. CASA KIRA TEAMS UP WITH THE TUCSON BOTANICAL GARDENS! I love it when local businesses and non-for profit start to think about carrying local products. The Tucson Botanical Gardens has joined the list of local businesses doing just that. The Tucson the Botanical Garden's gift shop buyer, Christine, knows that she has a loyal following of Tucson residents as well as tourists from out of town, who want to have a uniquely Tucson experience. She is now catering to both kinds of customers by bringing in Casa Kira's, locally handcrafted jewelry into the gift shop. Christina and I are both excited to watch the shift take place. Will keep you posted as to which pieces go into her shop. It's mid-September, time for me to gear up for the Fall Show Season. This year I have a nice variety of shows spread throughout October, November, and December. From the Large Outdoor Art Market to the private open houses, there will be something for everyone looking to find the perfect gifts for friends and family. And of course a good opportunity to treat your self as we head into Winter. More details to follow. I will keep you posted through the emailing list as well as the Facebook page. And as always, contact me directly by phone or email with questions or to book private studio appointments.